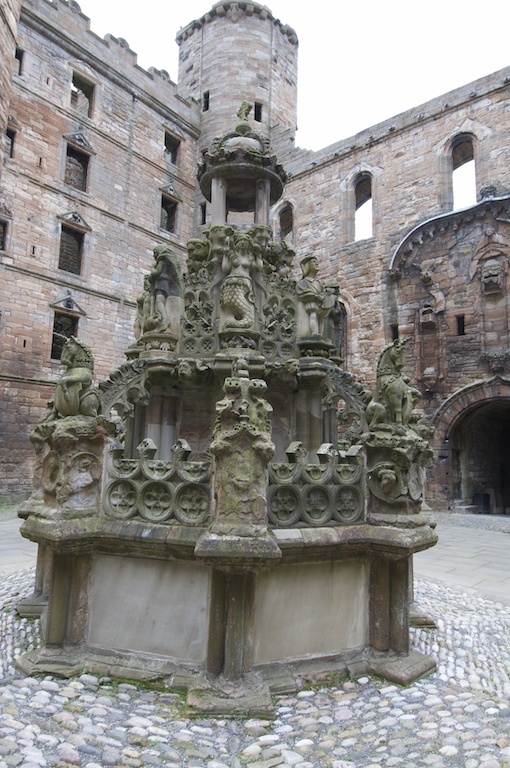 Built by James V in 1538, this ornate fountain graces the courtyard at Linlithgow Palace. Standing over 16 feet high and designed to reflect the supreme power of the king, it was probably fed by an underground water supply which was piped up to the carved crown at the top. Water fell from the crown – suggesting the king’s benevolence – into tiered bowls and out through rows of spouts shaped like mythical beasts and human heads. One of them is said to represent James V disguised as a peasant or ‘gaberlunzie’. When Bonnie Prince Charlie visited Linlithgow in 1745, the fountain was made to flow with wine. This was probably not the first time it had happened – another source suggests James V had the same idea, on his marriage to Mary of Guise. In 2007 the fountain was restored by Historic Scotland, so that water can now flow through it again, although it is not kept running because of the risk of erosion. Linlithgow Palace has a long and fascinating history! You can read more in this feature on The Hazel Tree. loved visiting here, amazing story and amazing place! I don’t know how you managed to show two different photos, but in my ‘Blogs I Read’ listing, you have a stunning aerial shot of the fountain. THAT is stunning. The other one above, is nice, but I like the aerial one more. Still, it’s a beautiful fountain nonetheless. I like the unicorns, they look beautifully carved. How stone can be carved so delicately is beyond me. I must visit Linlithgow Palace one of these days, thanks for the reminder. The craftsmanship really is amazing. Since writing this post I’ve been wondering if the stonework was actually painted, especially in view of their love of colour at that time. Yes, the Palace is really worth a visit. I’d like to look around the adjacent church as well – it was closed when we were there. One of the great (and little known) works of cultural vandalism was by the British Army at Linlithgow Palace, when they completely destroyed the interior by fire in 1745. These were the same ‘liberators’ that damaged priceless works of art within Holyrood Palace when they occupied Edinburgh. That’s very true, and it still seems to me like a burnt-out shell. I guess we must be grateful that the same didn’t happen to all the others. The fountain at Linlithgow Palace where ‘Ane Satire of the Three Estates’ was first performed in 1540. Reblogged this on Marie de Guise-Lorraine 1515-2015. Thank you for your comments Mary, and I’m glad to know that you loved Linlithgow so much. What a fabulous place it is, and I love the fountain too. I know too well how much of Scotland there is to see, in the form of quiet little churches and ancient sites. I’m glad you enjoyed your time here! Too bad the Star and Garter burned, as the train station is just behind. Saved on lodging in Edinburgh, finding parking, and there are many beautiful sites I would have missed staying indoors looking over films, fische and books. I found out now that records are digitized on line, I would have been better of seeing the other treasures of Scotland outside archives, museums. Like the beautiful tombstones in the cemeteries. Aye, I said I was an odd duck, but mornings with the doves and the fleets of graveyard rabbits, hold wonderful memories.